Korean management agency Cube Entertainment on Thursday announced it will not extend the contracts of the remaining four members of K-pop group 4Minute. This comes after it signed a contract with one of the group’s members, HyunA, who will resume activities as a solo artist, officially marking an end to the girl group that has lasted for seven years. The agency’s contracts with four members of 4Minute were terminated as of Tuesday. Hello, this is Cube Entertainment. We would like to make an announcement on the girl group 4Minute. Nam Ji-hyun, Heo Ga-yoon, Jeon Ji-yoon and Kwon so-hyun have officially left Cube Entertainment as their contracts were terminated as of Tuesday. We have discussed their future, but our conclusion, after contemplation, was not to renew contracts with them. We respect each member’s opinion. We would like to cheer on them. 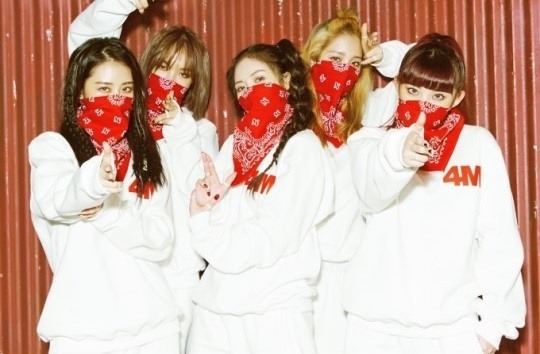 Following its debut in 2009, the company’s first girl group 4Minute has been one of the top-tier artist groups and shares a lot of memories and good feelings with us. It is our regret that 4Minute’s journey is over for now, with the remaining four members starting anew. May their future careers be blessed with fans’ warmhearted support.